This thesis is a macro-sociolinguistic study and comparison of language status and use in Rwanda and Uganda. The data was collected in fieldwork. The study covers the main formal domains in society, both official and non-official. A model for analysis, inspired by Chaudenson, was created. Termed the Multilingual Management Model (MMM), it uses a quantitative method to investigate specific domains and units of analysis in the two African countries. The analysis provides a percentage measurement of the position of languages or language groups vis-à-vis other languages within the linguistic space of each domain, i.e. the analyses reveal how languages are stipulated to be used as well as the extent to which they actually are used within the specified domains of society. The MMM, which is also influenced by the work of Bourdieu, among others, is based on the assumption that languages compete on a linguistic market. The MMM can be used for similar work in other countries. The investigated domains are dichotomised into official multilingual management and non-official multilingual management. The MMM contrasts official language policy, institutionalised language use within official institutions, languages in education, and language use in state media, on the one hand, with language use in the domain of trade and commerce, language use on private signs and billboards, language use in the domain of religion, and language use in private media, on the other. The results of the study largely confirm the proposed working hypotheses. Simultaneously, trends contradictory to the expected results and hypotheses were identified. The national language Rwanda was found to be widely used in formal domains. However, such use was less significant in official settings compared with non-official ones. Rwanda is also not used to its full potential as a medium of communication in all domains, except in typically oral domains. Ugandan languages are stronger than expected in some domains, e.g. on private radio stations, at markets, and in state newspapers. This demonstrates the communicative value of African languages which, sadly, is not reflected in official language policy in either country. The allocation of status to European languages through legal stipulations and the prestige attributed to them have negatively influenced the use of African languages in both countries. The work can be used as a strong and reliable reference on languages of Rwanda and Uganda. 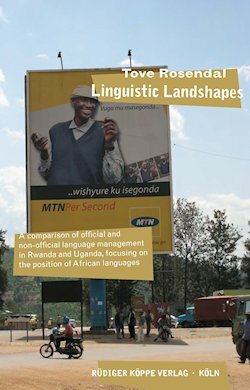 It in-depth describes a multilingual situation in Rwanda and Uganda and shows the complex situation of language status and use and aspects in which it differs in these two countries. The author not only presented a well researched, unique macro-sociolinguistic study that compares language situation in two countries, but also proposed a new approach to the comparative research in sociolinguistics.